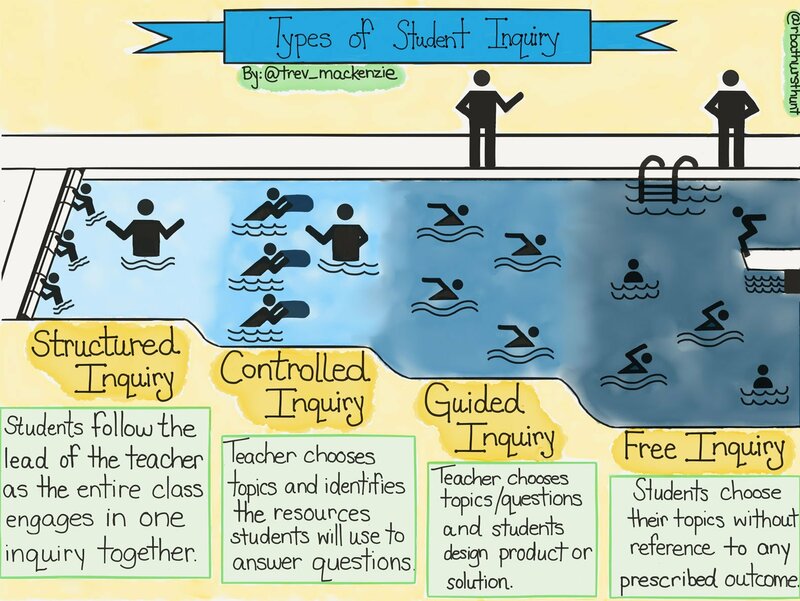 This past semester, I dove head-first into guided inquiry. Not really knowing what I was doing, and having only actually had about four hours' worth of instruction on how to recognize and implement some inquiry-based strategies into my curriculum, I more or less decided to give my eleventh and twelfth-grade German Culture kids carte blanche for a full semester. Of course, I also had to explain to them what carte blanche means, but once they understood what I was going for, they seemed excited. They were allowed to choose any topic they wanted--parties, cars, cliques, the environment--and then they had to write an inquiry question that fused that topic with German Culture. The end goal was for them to create some kind of product or presentation that provided their peers with the knowledge and motivation necessary to answer that particular question. One of the tools we used on this five-month-long adventure was blogging. My initial thought was that I could sort of trick my students into creating individualized writing portfolios by asking them to submit weekly reflections about their research progress and personal development. Because the kids were already a close-knit group (having had German together for three previous semesters), I had also hoped that they would feel excited about being able to provide peer feedback to each other and/or to be able to share resources and ideas. Perhaps they would even want to share their writing with their pen pals or exchange partners in Germany. I had them set up their accounts on Blogger and then posted links to each of their blogs on the course website. We opted to alternate between two different types of entries: Temperatur posts (reflections on personal growth and development throughout the course) and Aktuelles posts (analyses of current events articles related to their research topics). The students worked together to set the necessary criteria for each type of entry and then created two distinct grading rubrics for them. The expectation for the first quarter was that they would write one entry per week, alternating back and forth between Temperatur and Aktuelles entries. After the first week of Temperatur posts came through, I sat excitedly at my desk reading through my students' personal reflections (in German!) about their literacy skills, searching strategies, struggles with teamwork and linguistic hurdles. I was enthralled to have a small window into their thought processes and to be able to witness their growth. "Don't you guys love this?" I asked, enthusiastically waving my coffee cup at them. "You can vent, complain, brag, ask questions and tell me how you feel in these things! And in a few weeks, you'll be able to see how your confidence and skills have grown!" Alas, my students absolutely, positively hated the Temperatur posts. I don't know why I assumed that teenagers would be able to easily express their feelings in writing somewhere (in a foreign language, no less), let alone feel enthusiastic about doing it. But when I realized my mistake, I literally facepalmed and closed my eyes, flashing back to my sophomore English class and momentarily reliving the horror I felt every time I had to submit a piece of free writing to Mrs. Ruth. Sometimes I forget that adults are scary. Or that I am one. On the other hand, my students actually loved the Aktuelles assignments, explaining that it really helped them to fully understand a particular text when they had to sit down and analyze it, as well as include a brief list of key vocabulary terms (their decision). They really enjoyed trying to find connections between the news reports and their topics and said they learned a lot from some of the lengthier articles with specific facts and case studies. By the second quarter, however, it had become obvious that weekly blog writing was far too demanding of an expectation to have from students who were also simultaneously researching, reading, analyzing and presenting other materials. Additionally, it did not seem like enough time was passing between Temperatur entries for them to really see any noticeable changes in themselves. And the Aktuelles posts required so much time and preparation that they needed a full day or two to complete them. We reduced the number of blog entries due for the second quarter of the course. We increased the amount of class time students got to do independent research and/or work on assignments like blogging. We provided an alternative for Termperatur posts: students could instead approach me in person to explain via a conversation how they were doing, to ask questions they might have, to show off artifacts that showcased their growth and/or to share ideas for their final presentations. By the end of the quarter, I had so many students signing up for speaking appointments (as opposed to writing Temperatur posts), I could barely keep up. As it turns out, teenagers actually do like to express themselves; they just want to be able to react to your reactions when they do. On the last day of class, after all presentations were over and final projects were submitted,we had a round table discussion about how to improve the course for next year. The kids were really excited (probably at least in part because I provided them with coffee and let them bring pancakes). They had a lot of great feedback for me and I was very happy to see that even my more reserved students were readily contributing to the conversation. They unanimously agreed to keep the Aktuelles posts, but wondered if I couldn't determine a small and finite number of entries to be due each quarter that future students could then complete when it was most convenient. "No, because then I am going to get five Aktuelles posts on the last day of the quarter, all backdated to make it look like they were done over a span of six weeks." "Yeah... I guess that's true, Frau." We ultimately decided that one Aktuelles post every two or three weeks would be reasonable, possibly with a bye week of each student's choosing. As for the Temperatur entries, my students emphatically suggested that they be replaced entirely with the speaking alternative mentioned above. They spoke at length about how much easier it is to talk about something of a personal nature when face-to-face with me or their peers. They additionally suggested that I include a larger variety of reflective speaking activities such as Speed Dating (rotating throughout the class and sharing ideas with someone new for two minutes) or small group discussions. As a final recommendation, they explained that they should have been able to have pancakes and coffee in class more often, as they work more productively that way. I am inclined to agree with them on all counts. I see the caffeinated part of the blog name is very accurate! 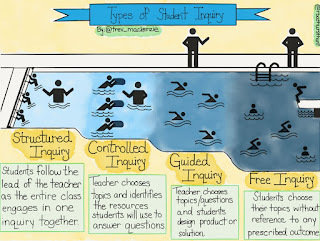 Jumping into an inquiry model of teaching was very brave of you. I am impressed that your first year went so well. I do have a question. If you want to reduce the amount of time required to meet with students 1-1, could you keep the requirement for the Aktuelles posts in German and switch the Temperatur posts to English? I am currently working on improving my German on my own. I took two courses at the Volkshochschule in Heidleberg while I lived there and I know how difficult it is for me to express myself. If I had the opportunity to blog about my progress in English, I would be able to express my frustrations and victories easily, and communicate with you and perhaps receive feedback (in German) from you. Do you think that would work? Hi Mary! I probably should clarify a little: though a little overwhelming, I actually also liked meeting with the kids one-on-one more often (than we had been doing previously). It wasn't a huge problem. We could streamline it better if I'd thought of it earlier (or if we'd known that was how the Temperatur posts were going to turn out) using a Google Calendar schedule with appointments. So that's not really a big deal. I will probably continue to do that next year. As far as English goes, I have to say I don't think it's a good idea. I totally understand the urge to go back to your native language when you feel uncomfortable, but if we let the kids do that, they would never speak German. As juniors and seniors, they have already built up a very large base of vocabulary and structural knowledge in German and part of the challenge of the Culture course (which has absolutely ZERO straight grammar/vocab assessments in it, by the way) is to learn the new vocab and structures necessary to talk about themselves, their growth and their research. In fact, this sentiment was echoed by the kids themselves, who complained about the few times I *did* let them use English during class, while conversing, to reflect on things or complete a speaking activity. They agreed emphatically that the entire course should be 100% immersion and that they need to learn how to circumlocute (talk around) the stuff they couldn't easily say. All I can tell you is: the more strict you are about sticking to a new language no matter what, the faster you'll learn it and the easier it will become for you. We basically require an immersion environment in my district/school for World Languages courses anyway, so allowing any English whatsoever is really a no-go. I also kind of personally feel that it wasn't so much the German that was the hurdle, but rather the fact that they were too nervous to write their feelings out on a screen without the opportunity to react to me at all. They had no problem expressing themselves in German when we had the in-person chats! Congrats on working on your own German! Let me know if you have any questions. I also love the Heidelberg area (and was just there myself about a week ago!). Great that you got the chance to study at the Volkshochschule! Thanks for the clarification, that makes much more sense now. At the Volkshochschule I was so hoping there would be some conversational aspect, but it was all geared toward vocabulary and grammar, all in German. But then, I was only able to take two levels, so perhaps at the higher levels there is more conversation. Looking back on my high school French days, I wish I could have been in the environment you are describing, in fact, I'd like to be there now! Second language instruction has changed A LOT over the last several years--even since I was in high school in the 90s! It used to be that you'd sit at your desk and passively listen to the teacher (who spoke mostly English) as he or she explained what vocabulary terms meant and/or how to use a billion different grammatical structures. The grammar would become more difficult with each level and you were expected to know more vocab every year, but the format of the class never really changed. And the materials were primarily textbooks (inauthentic collections of texts made specifically for language learners) and audio recordings (also inauthentic). I cannot even remember having a speaking assessment in German class. I am sure I did at some point, but obviously it wasn't noteworthy or common. In contrast, the push now is to practically stick the kids in a virtual Germany/Spain/France/China, etc. and to only teach grammar when necessary as a side thing, not the focus of a lesson. In my classroom, we only speak German. We do not use any textbooks, but rather read actual news articles, books, letters, magazines, etc. We watch German television shows (I have online subscriptions to the corresponding German television stations via the school), news clips, YouTube clips and movies. We have sister schools in Germany with which we exchange projects and letters. We Skype German students in class when possible. And though I do explain how to conjugate a verb (it almost always inevitably comes up) or what der/die/das/dem/den, etc. means, I basically NEVER test on those concepts. Instead, from Level 1 up, the assessing is all basically asking the same question: "What can you say without resorting back to your native language?" This allows us to focus on things like inquiry classrooms or thematic learning or virtual trip-planning, etc. instead of assigning and/or reviewing fifty pages of verb conjugations throughout the course of a semester. And the best part is that the biggest factor behind the push for "authentic" language learning is the College Board. They changed the AP language exams so that they all reflect the new stuff I just mentioned and so that the kids are not penalized for every little grammar thing--which is truer to real life. So yeah... I quite like it! And I wish I'd been taught that way too!! That sounds so fun! Can you tell me what German stations you subscribe to? I don't know that I can afford it, but it would be amazing. I found a podcast call Slow German http://www.slowgerman.com/ that is great. I understand 90% of what she is saying, but I know my weak area is speaking. My husband speaks German (his mom is German and her mother lived with them when he was little) so I practice with him, but I would love to have group of people I could talk to. I know that adults have a very hard time with learning a new language because in general the won't talk until they can do it right (never) while kids just jump in and talk. I know I am very reluctant to talk to my husband's family in Germany. They certainly aren't judgmental, but I can't talk about what's in my brain because I don't have the vocabulary...and I don't have the vocabulary because I don't talk. What a catch-22! Oh, totally off the point, I notice you're using both comments moderation and captcha. I only use comments moderation on my blogs, because nothing is getting up if I don't allow it and sometimes the captcha images are brutal. Just thought I'd put that out there. Haha, I actually had moderation turned completely off but Captcha was on (because I never think about it until a kind soul like you reminds me it's on!). I've turned off Captcha, so hopefully that is less cumbersome. Thanks! I watch shows on ZDF and ARD (the two public German television stations) and ProSieben. There are more though. Thanks for sharing the Slow German podcast link. I have heard of that before but haven't checked it out yet. And yes, you are exactly pinpointing the problem with speaking a foreign language--as well as the reasons for our immersion requirement! I would say go for it and say what you can, even if it's flawed or sounds like baby-talk to you at first. You will get better and even be able to use hand gestures and facial expressions until your relatives and/or husband can supply with you the missing words--which you will quickly retain after a few times hearing them when you need them. It was very enlightening to read your blogging experiences with your high school students. I would like to do something similar with my elementary general music students this year, grades 4 & 5, with their reactions and evaluations of various musical selections. I only see my students once a week for 40 minutes, so I am concerned about how much time I can devote to blogging with them, so your insights about the time commitments were very helpful. I feel strongly about both aspects, working with students and helping them learn how to blog their thoughts, and learning to express what they are hearing in music. I appreciated how you included your students on your year-end evaluations. I don't feel we listen to students and their ideas learning enough. Thank you for some great thoughts and ideas.